The other kind are bare and dusty, filled with tumbleweed and cactus. Usually old, though not always. Graveyards, not cemeteries. 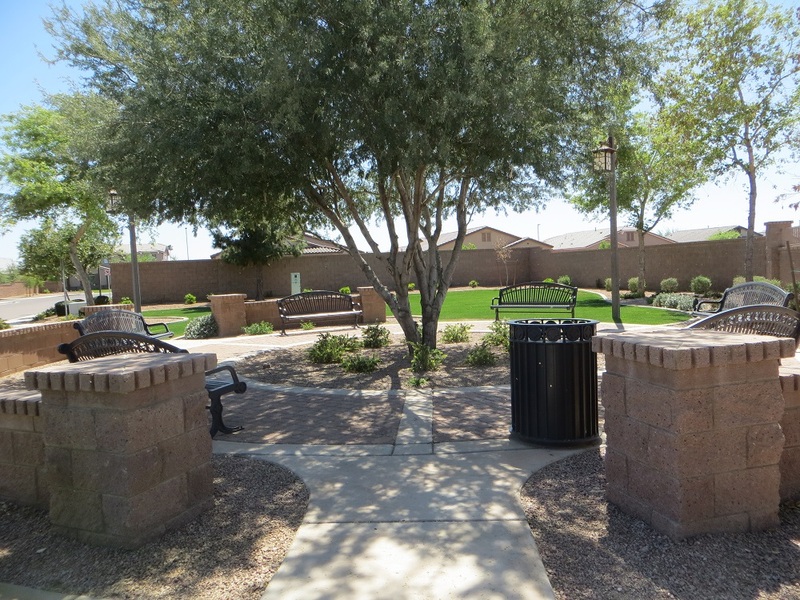 In the town of Chandler, a southern suburb of Phoenix, is one of the latter. I found it listed on a web list of Phoenix historic sites and was happy to find it a just few miles from my brother’s house. 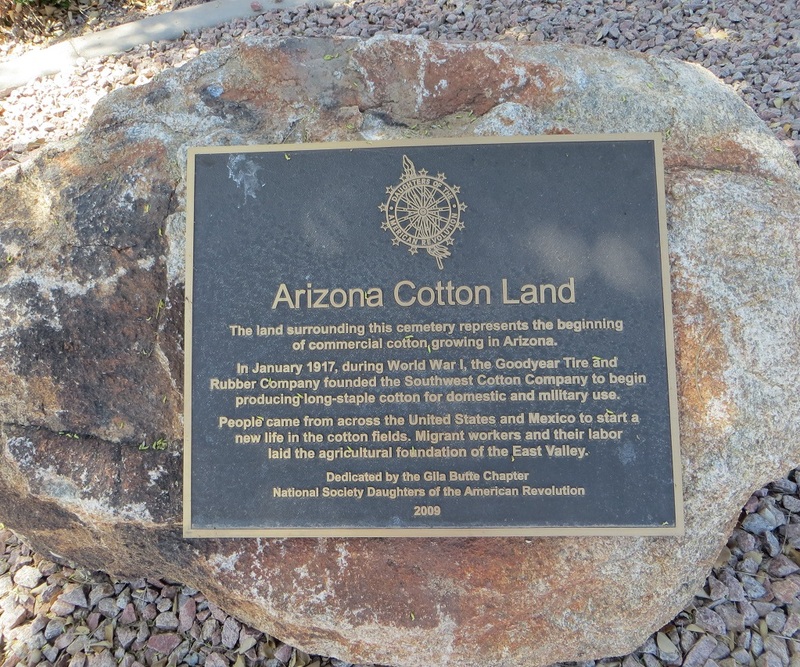 During World War I, the Goodyear Tire and Rubber Company leased 8000 acres in Chandler to cultivate cotton to be used for military airplane tires. A community, made up of Goodyear’s agricultural workers, developed there. In 1943, Goodyear decided to move its operations to a larger plot of land west of Phoenix and after it did, the community petered away. Left behind was the cemetery, a three acre plot with about 250 graves. If by “preserved” Fulton Homes means “we didn’t remove the bodies or simply build homes on top of them,” then I suppose they preserved the cemetery By any other definition, “preserved” is an overstatement. The property is clear of trash and overgrowth — the website of the local newspaper has pictures of the Fraternal Order of Police having a clean-up day there in 2008 — but not much else has been done with it. 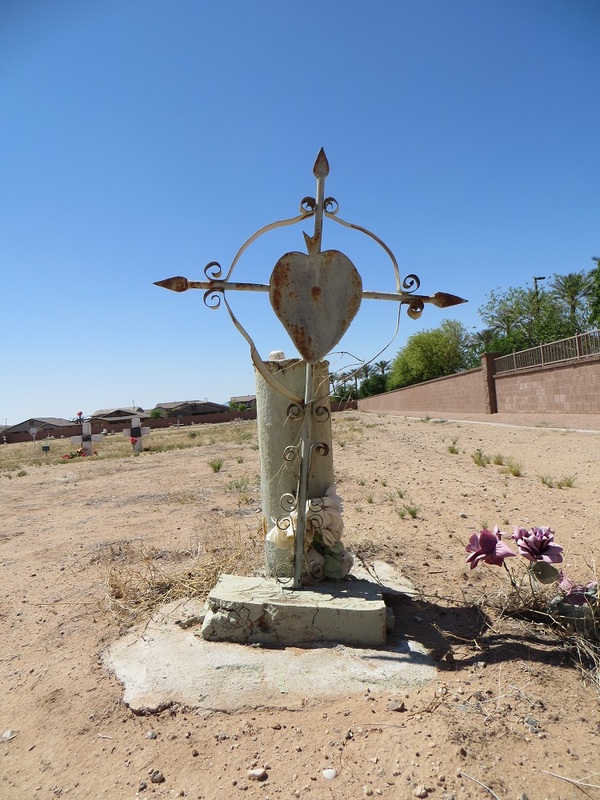 Most of the graves were just mounts of dirt with some evidence — a broken wooden cross, a plastic flower stuck in the ground — that it was a grave. There was no uniformity to the existing markers — clearly every family was on their own. I only saw a few with discernible names and all the names were Hispanic. 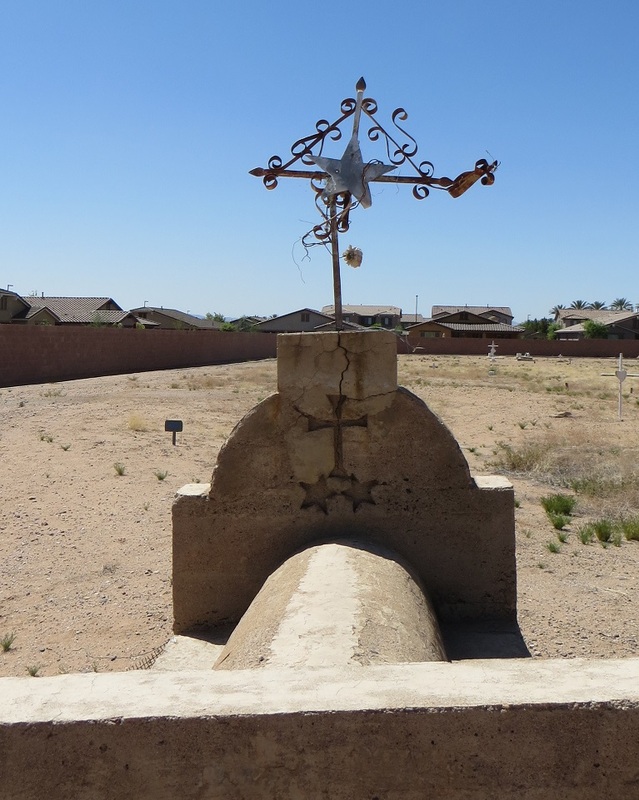 Goodyear had segregated its workers – Hispanic, Native American and Anglo — so perhaps this was the cemetery for Hispanic workers. None of the write-ups say. There were a couple of graves that seemed to have some recent activity. It would be nice if the development company or the community or the Goodyear Tire Company took this cemetery on as a restoration project. 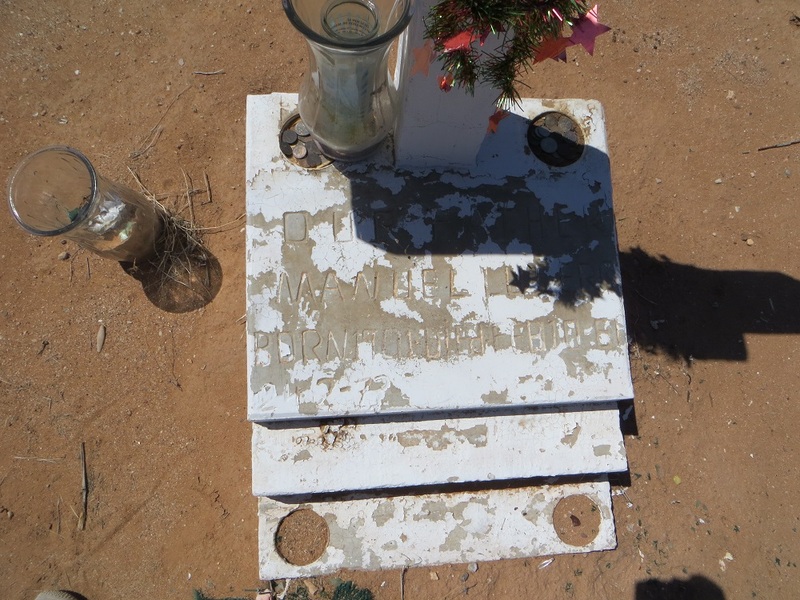 While it is good to see it clean, it would be better if the broken grave markers were fixed and up righted. The title of this post is a line from one of my favorite plays: A Streetcar named Desire. The wrought iron grave markers reminded me of New Orleans. 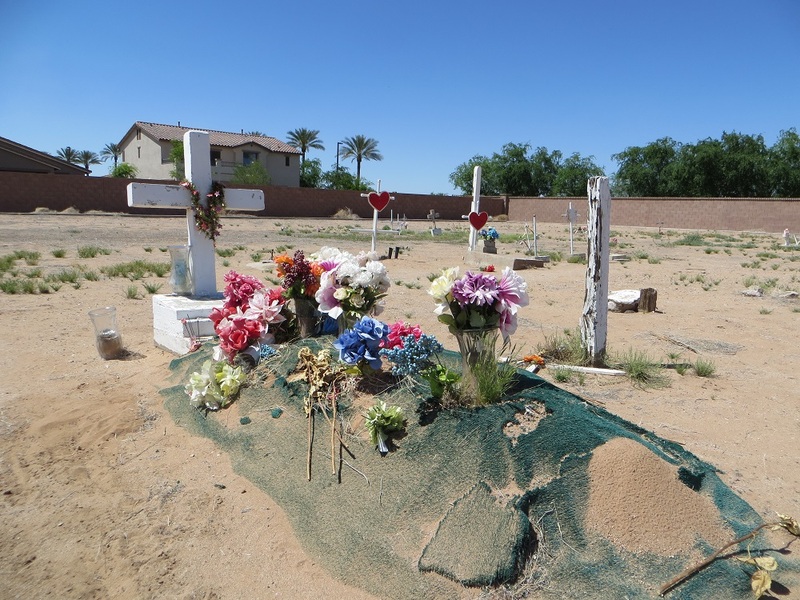 Gallery | This entry was posted in Arizona and tagged Arizona, Arizona graveyard, Chandler, Goodyear Ocatillo Cemetery, Goodyear Tire and Rubber Company, Phoenix. Bookmark the permalink. There’s a feeling of desolation in those photos. I wasn’t really a cemetery visitor until we went to Pere Lachaise (?) in Paris, which was absolutely fascinating. I like Williams, I’ve read most of his gloomy moody plays. And the film of Streetcar was fantastic. The combination of Leigh and Brando was perfect. The cemetery definitely had that abandoned and windswept thing going for it. I was at Pere Lachaise 20 years ago. I remember that it was very crowded and urban: the “opposite” of Goodyear-Ocotillo. And that people left money on Jim Morrison’s grave. Very sad. There seemed to be lots of money in the surrounding community. I’m surprised that there isn’t some sort of effort to restore it. I tend to like the lush, park-like ones you occasionally see that encourage the living to use the space to admire the views as well as visit the dead. Less depressing and more likely to be maintained. I am glad your family has a condo. As I age, I am less satisfied with my families arrangements, or lack of them. I know where I am going – had my name put on my husband’s headstone years ago. But when my father passed, the family decided to have him buried at sea, to respect his complete horror of funerals. But now, what do we do with Mom when she goes? My immediate family has been so physically close to each other all of our lives, but it appears we are going to be split up when we die. I think that’s the way it is for many modern families — the tradition of the family plot has gone by the wayside. We actually have an ancestral plot on Maui, but knew that the next generation wouldn’t be able to visit as often if we were there, and they themselves would have no interest in being buried there. Thus the condo in Phoenix. I photographed the cemetery in 2000. I was lucky enough to have the Chandler Historical Museum exhibit the photographs. 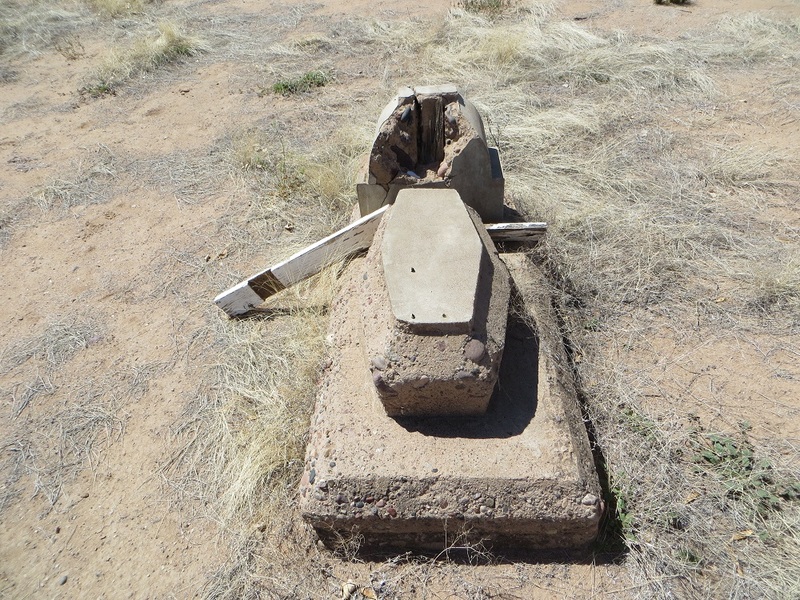 The cemetery was covered with tumbleweeds, obscuring many of the grave markers. Shortly after the exhibit at the museum a boy scout troop came in and cleaned up the cemetery. 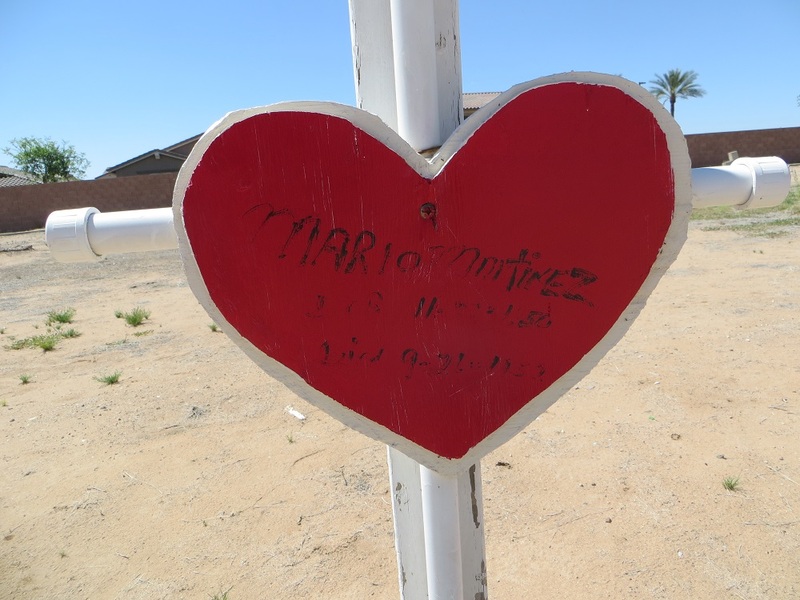 They up righted the markers and whitewashed the wooden crosses — it looked nice. Last month, just out of the blue, I decided to revisit the old graveyard. Boy have things changed in 13 years. 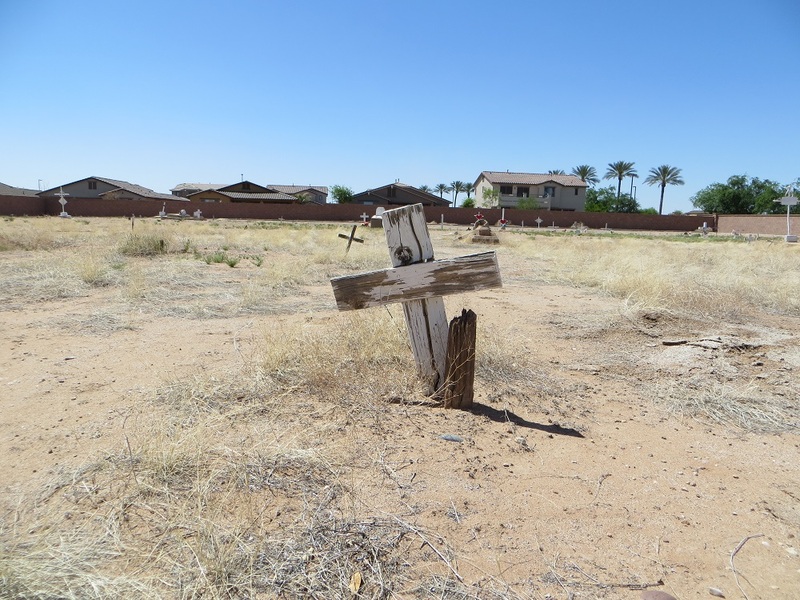 The tumbleweeds may be gone, but hardly any of those whitewashed wooden crosses remain. I was saddened to see the site in such a state. I guess that’s why photography will always be a hobby for me. In a way I am preserving these places, long after these sites are gone, I will still have the pictures. How terrific that the boy scouts straightened the place out, and how sad that it has been allowed to deteriorate again. Do you have a website where you post your photos? Sorry, I don’t have a website of photos. I’m kind of old fashion when it comes to my photography. If you give me an email address I will send you a few pics. You can see how much the graveyard has changed in over a decade. Thanks. I’d love to see a couple of pictures of the old graveyard. The email is: sakalasunas@thehistorytourist.com. Thanks. An email is on its way. It is nice that you took these pictures and posted them for all of us to see. However, I feel that your often negative comments that accompany them are somewhat misguided. I get the feeling that you think you have done your part by exposing the problem with your pictures and now someone else is responsible for the rest. There are cemeteries in much worse condition than this one all over this country, probably all over the world. As often happens in life, families move on and no one is left to take care of these “abandoned” places. Who do you think is responsible now? If someone cleans the place up and erects a wall to protect what remains, are they forever responsible? I think not. While it is easy to say that some unnamed entity should take care of it, it doesn’t get the job done. Someday, someone will notice the deterioration and take care of it again, for awhile. I think that is the best we can hope for. We should be thanking those occasional Good Samaritans and not criticizing them because they did not come back. Thanks for your comments. But I think that you’re misinterpreting my post. It’s not my intent to “expose” anything. This is a tourist blog, not investigative journalism. I said that I thought that it would be nice if someone took the cemetery on as a project. I don’t think that’s negative at all. I do think that it would be nice — a really terrific project for the school across the street, or the community that surrounds it. I’m not criticizing anyone who has helped in the past for not continuing to help and I’m definitely not saying that it’s their responsibility to do so. Unless someone is taking money to keep the place up, it certainly is no one’s responsibility to do so. Community and history-centric groups are “adopting” old cemeteries for exactly the reason you’ve mentioned — people die away and there’s no one keep them up. And they are wonderful historical and cultural assets worth saving.